We all want beautiful gorgeous hair on our scalp but sorry, hair on face is a complete no-no. It may be ok for a man but for a woman it is definitely her worst nightmare. No matter how much flawless your complexion is, having hairs on your face hamper the entire look. On the other hand, having no facial hair automatically makes your face look bright and clear even if you do not possess the perfect glowing skin. Therefore, the quicker you get rid of those unwanted facial hair, the early you save yourself from getting embarrassed. Are you also among the many women battling the problem of unwanted facial hair? Well, then you are reading the right post as today, in this post, I will be discussing with you about various natural remedies to remove unwanted facial hair easily at home. Facial hair is completely unwanted and is the main cause of embarrassment and concern for women of all age groups especially the younger lot who are obsessed with their looks. Girls of today’s generation go for many hair removal techniques like waxing and threading, which are really painful and sometimes lead to red blotches, to the more expensive ones like electrolysis or laser hair treatments, those that cannot be afforded by many. 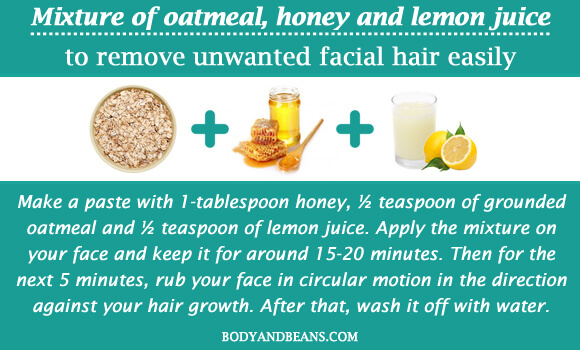 But have you ever thought of trying the natural home remedies to remove unwanted facial hair? Do you even know how these remedies work? Well, in case you are unaware, let me tell you that there are several common kitchen ingredients, which are very effective in removing facial hair. Today in this post, we’ll learn about such remedies that’ll help you remove unwanted facial hair easily and effectively. However, before talking about these natural remedies to remove unwanted facial hair, let me tell you about the causes that lead to growth of hair in your face, sometimes on an alarming rate. I know facial hair is very frustrating, but don’t you want to know the causes behind it? If you know the causes, it will be easier for you to get rid of them. Well, the main factor is the increasing levels of the male hormone androgen in female body with age or in maximum cases, due to some medical condition. Here are some of the factors that lead to the growth of unwanted facial hair. Now that you have known the causes, you have to consult with your doctor to cure your medical condition while in the meantime you can try out some of the natural home remedies to remove unwanted facial hair that I am sharing with you. Facial hair is a complete turn off and spending bucks on expensive hair removal techniques and procedures is not a cup of tea for all. 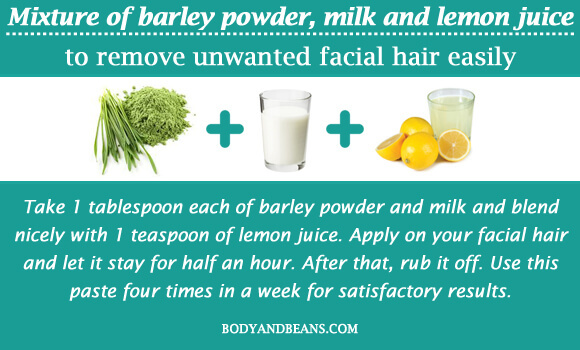 Lucky for you, there are several natural ingredients that can be used to remove unwanted facial hair easily at home. These methods are safe and affordable and also very easy to apply. So if you are tired of various hair removal procedures without much success, it’s time to try some of these natural remedies to remove unwanted facial hair. 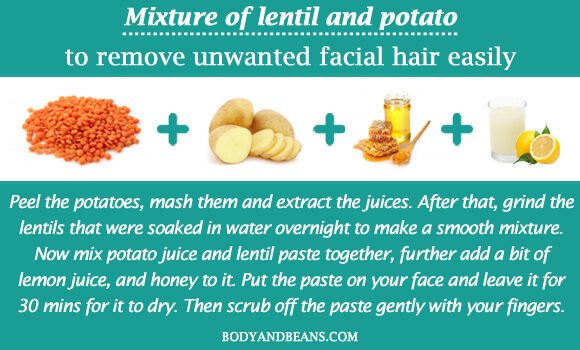 This method tops my list of the best natural home remedies to get rid of unwanted facial hair and it has been in use since ages. Sugar, when warmed sticks to the hair on your face and naturally, when you wash it off, it rips off the hair along with it. 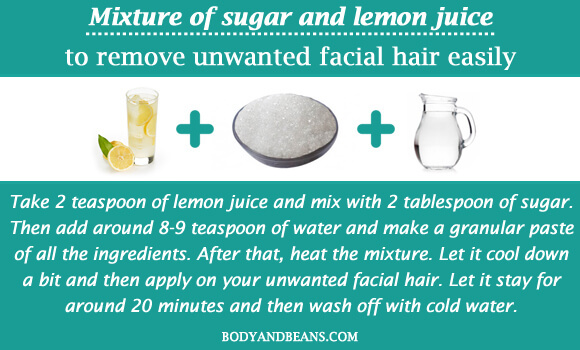 Lemon juice on the other hand, is natural bleach that lightens off your skin tone and removes the excess facial hair. You need to take 2 teaspoon of lemon juice and mix with 2 tablespoon of sugar. Then add around 8-9 teaspoon of water and make a granular paste of all the ingredients. After that, heat the mixture. Let it cool down a bit and then apply on your unwanted facial hair. Let it stay for around 20 minutes and then wash off with cold water. This method is generally suited for all skin types and can be used thrice weekly but make sure you do not overheat the mixture. Also, do not keep the mixture for too long as it may dry up your skin. Women having dry skin can use this mixture to remove unwanted facial hair as it completely suits your skin type. The moisturizing honey is very beneficial for your skin. It is a natural moisturizer that stimulates the production of sebum. Honey when mixed with lemon juice and a bit of sugar works like a natural wax but is much safer to use that its chemical counterparts. Take around 2 tablespoon of sugar, 2 teaspoon of lemon juice, 1 tablespoon of organic honey, 2 teaspoon of cornstarch and a bit of water if your want. Then heat the mixture of honey, sugar and lemon juice for 3 minutes. Allow this waxy paste to cool down and in the meantime put some cornstarch on your unwanted hair. Then apply the paste evenly on your unwanted facial hairs. After that, pull the hair out using waxing strip. Use this twice weekly to get best results. However, people with sensitive skin may avoid this procedure. Turmeric is another ingredient that is used for treating several skin issues since ages with removing unwanted facial hair being one of them. Turmeric is an antibacterial and antiseptic agent that helps to get rid of the unwanted hair and also protects the skin after the hair is ripped off. 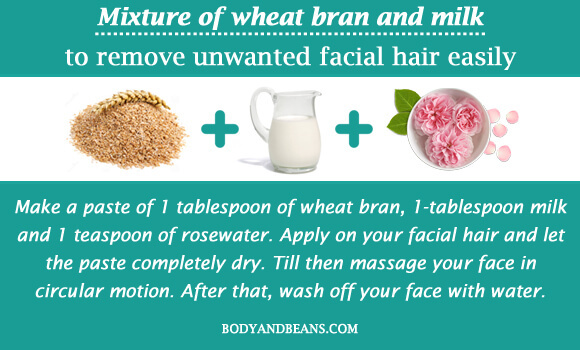 Mixing rose water or milk makes it ideal to remove the facial hair. Generally, I suggest the ones with oily skin to go with rose water while those with dry skin can use milk. First, you need to take around 2 to 3 teaspoon of turmeric powder and then soak it in milk or rosewater. Blend the ingredients well to make a smooth paste and then apply it on your face. Keep it for 20 minutes and then wash it with warm water. In order to uproot thick hair you may add a bit of gram flour, ground oats or rice flour in it as well. This method can be done daily for effective results. However, please do not overuse turmeric as it may leave an unhealthy yellowish tinge behind. Waxing causes you lot of pain but if you want to opt for a painless method, you may opt for this mixture. The oatmeal used here contains avenanthramide class of antioxidants that soothes the skin of all kinds of rashes, itching and skin redness. An oatmeal scrub leaves your face hydrated; soft and clear as well as removes all the unwanted facial hair. Honey is a natural moisturizer while lemon juice helps to brighten up your face. You need to make a paste with 1-tablespoon honey, ½ teaspoon of grounded oatmeal and ½ teaspoon of lemon juice. Apply the mixture on your face and keep it for around 15-20 minutes. Then for the next 5 minutes, rub your face in circular motion in the direction against your hair growth. After that, wash it off with water. Repeat this process twice weekly for effective results. Gram flour is very good for your skin and is very effective for removing the unwanted hair from your face. 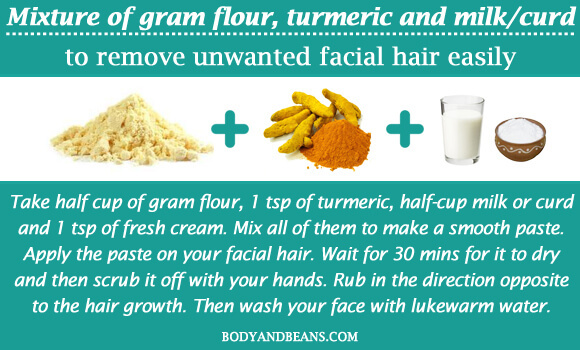 Mixing the skin friendly turmeric and milk/curd with gram flour makes the mixture appropriate to get rid of the facial hair. This paste sticks to your facial hair and when you rub them off, the hair automatically comes off. You can use curd if you have oily skin while rest can go for the milk. You need to take half cup of gram flour, 1 teaspoon of turmeric, half-cup milk or curd and 1 teaspoon of fresh cream. Mix all of them to make a smooth paste. Apply the paste on your facial hair. Wait for 30 minutes for it to dry and then scrub it off with your hands. Rub in the direction opposite to the hair growth. Then wash your face with lukewarm water. Use this remedy thrice weekly to get satisfactory results. 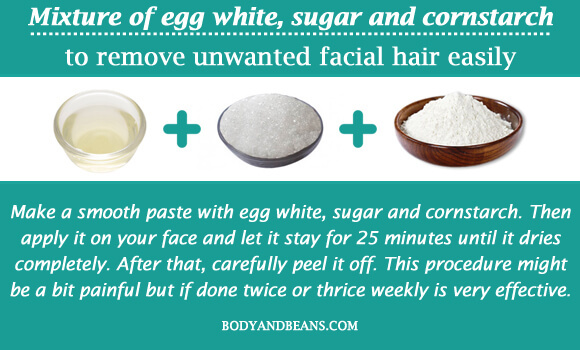 Another natural home remedy that is very useful to get rid of your unwanted facial hair is the mixture of egg white, sugar and cornstarch. Egg white is sticky and forms a thin layer on your face. Therefore, when you scrub it off, the facial hair comes out along with it. Sugar aids to the stickiness, thus making the scrub more effective. Cornstarch on the other hand, gives it a smooth and thick consistency. Make a smooth paste with egg white, sugar and cornstarch. Then apply it on your face and let it stay for 25 minutes until it dries completely. After that, carefully peel it off. This procedure might be a bit painful but if done twice or thrice weekly is very effective. However, women with acne prone or sensitive skin must avoid this remedy as it might lead to breakouts but if you still want to use it, just do a patch test first. Papaya is very good for your skin and helps to remove the unwanted facial hair. Papaya, besides exfoliating your skin dilates the facial hair follicles, which enables them to fall off fast. It also removes the dead skin cells and clears your skin thoroughly. 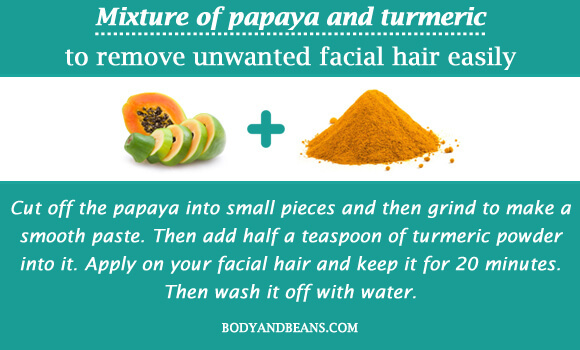 Moreover, adding turmeric powder with papaya makes your skin glowing, smooth and hair free. Cut off the papaya into small pieces and then grind to make a smooth paste. Then add half a teaspoon of turmeric powder into it. Apply on your facial hair and keep it for 20 minutes. Then wash it off with water. This remedy can be used thrice weekly and is suited for all skin types. 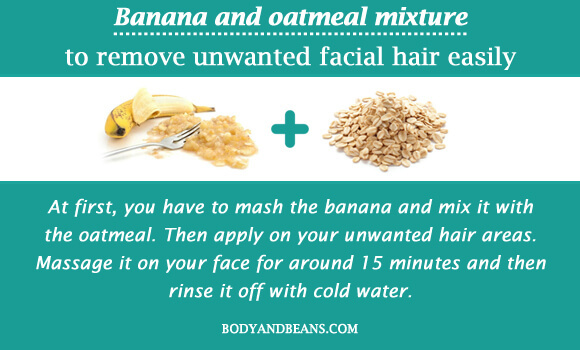 By now, you already know how efficient oatmeal is in removing the unwanted facial hair. This soothing oatmeal when mixed with the moisturizing banana becomes even more effective for treating the unwanted hair issues. Besides, this scrub becomes a natural humectant that provides proper nourishment to your face. At first, you have to mash the banana and mix it with the oatmeal. Then apply on your unwanted hair areas. Massage it on your face for around 15 minutes and then rinse it off with cold water. This exfoliating face-mask is favourable for all skin types and applying this once weekly will give you glowing hair free skin. Onion has many benefits including benefits for hair, skin and health. Onion is general helps in hair growth and improving hair texture. 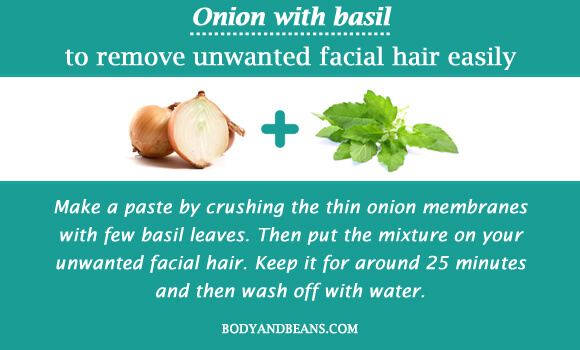 However, when used along with basil, it gives a reverse effect and helps you get rid of the unwanted facial hair. The thin transparent membranes of onion are the ones that aid you in the process. Make a paste by crushing the thin onion membranes with few basil leaves. Then put the mixture on your unwanted facial hair. Keep it for around 25 minutes and then wash off with water. 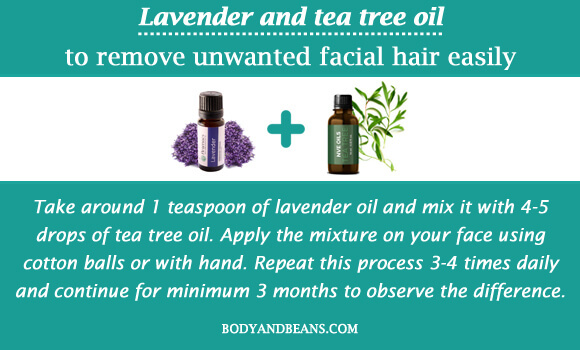 Repeat this process 3-4 times weekly and continue it until the unwanted hair from face is completely rooted off. 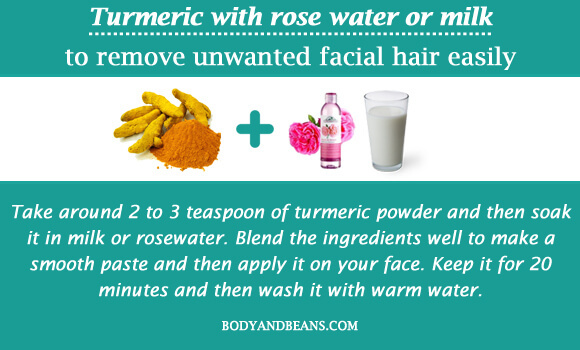 Both the ingredients are good for your skin and when mixed together helps to remove the unwanted facial hair. Also, the catecholase present in potatoes lighten your skin tone. 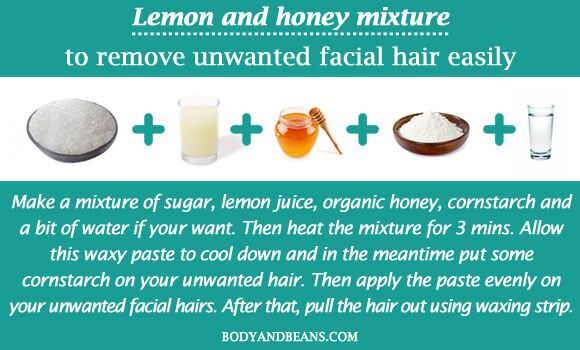 You may add a bit of honey and lemon juice to make the mixture more effective on your unwanted hair follicles. Peel the potatoes, mash them and extract the juices. After that, grind the lentils that were soaked in water overnight to make a smooth mixture. Now mix potato juice and lentil paste together, further add a bit of lemon juice, and honey to it. Put the paste on your face and leave it for 30 minutes for it to dry. Then scrub off the paste gently with your fingers. Use this process once or twice weekly. However, do apply a mild moisturizer if your skin gets dry after using the mixture. Women suffering from hirsutism have very thick and dark facial hair that often gets very difficult to remove. However, both lavender and tea tree oil are anti-androgenic that helps to lessen the growth of hair. Take around 1 teaspoon of lavender oil and mix it with 4-5 drops of tea tree oil. Apply the mixture on your face using cotton balls or with hand. Repeat this process 3-4 times daily and continue for minimum 3 months to observe the difference. However, people who have acne prone skin must do a patch test before using it as tea tree oil often lead to itching, swelling and skin rashes. This is one of the ideal mixtures for skin and is also one of the best natural home remedies to get rid of unwanted facial hair. Milk and lemon juice are very nutritious for skin and are effective in removing unwanted hair but when they mixed with barley, the mixture becomes ideal. It sticks to the facial hair and when scrubbed, removes the facial hair. Take 1 tablespoon each of barley powder and milk and blend nicely with 1 teaspoon of lemon juice. Apply on your facial hair and let it stay for half an hour. After that, rub it off. Use this paste four times in a week for satisfactory results. However, please avoid inhaling barley flour as it may lead to asthma issues. You must have seen advertisements where the model peels off orange mask to reveal bright glowing skin. 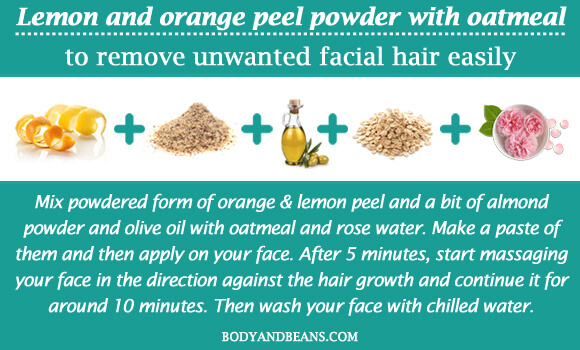 Well yes, the mask of orange and lemon peel with oatmeal works wonders for skin and is definitely counted among the effective natural remedies to get rid of unwanted facial hair. The mask is generally very sticky which when scrubbed, rips off unwanted hair along with it. Mix powdered form of orange and lemon peel with oatmeal and rose water. You may also add a bit of almond powder and olive oil in it. Make a paste off all these ingredients and then apply on your face. After 5 minutes, start massaging your face in the direction against the hair growth and continue it for around 10 minutes. Then wash your face with chilled water. Use this remedy 2-3 times per week to get effective results. However, people who have very sensitive skin may avoid this. Apricot contains various antioxidants that are highly beneficial for your skin. As far as honey is concerned, we all know that it is an antibacterial and antimicrobial agent that fights various skin infections as well naturally moisturizes our skin. 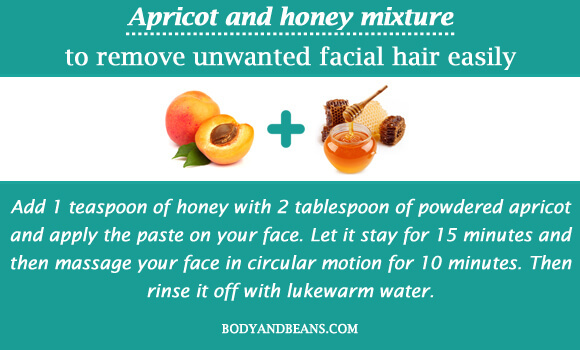 But do you know that the apricot and honey mixture is very good for removing your unwanted hair? Well, yes, this paste when dries up helps to rip off the stuck hair from your face. You need to add 1 teaspoon of honey with 2 tablespoon of powdered apricot and apply the paste on your face. Let it stay for 15 minutes and then massage your face in circular motion for 10 minutes. Then rinse it off with lukewarm water. For best results, repeat it thrice weekly. However, people with oily skin must be a bit careful while using this as it may lead to breakouts. You may even try out this method for removing your unwanted hair. We get wheat bran by refining the grain of the wheat. This wheat bran is highly nutritious and is very good for skin. It is used in various cosmetics for example in wrinkle creams or scrub etc. This, when mixed with the moisturizing milk becomes sticky which helps you to remove the unwanted hair from your face. Make a paste of 1 tablespoon of wheat bran, 1-tablespoon milk and 1 teaspoon of rosewater. Apply on your facial hair and let the paste completely dry. Till then massage your face in circular motion. After that, wash off your face with water. This mixture suits all skin types and can be used daily but if you have a very sensitive skin, then use it 3 times weekly. 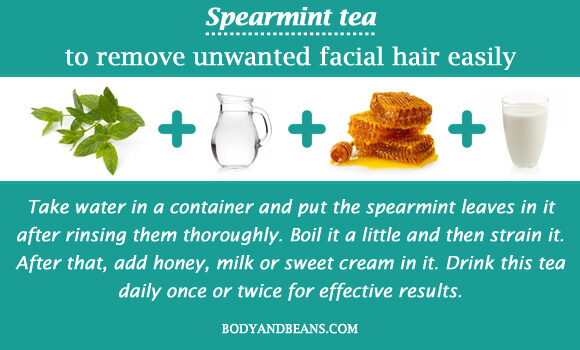 Drinking spearmint tea is another method that must be counted as one of the best natural home remedies to get rid of unwanted facial hair. It reduces the levels of testosterone in female body and lowers the production of androgen, which in turn reduces the growth of unwanted facial hair in women. Take water in a container and put the spearmint leaves in it after rinsing them thoroughly. Boil it a little and then strain it. After that, add honey, milk or sweet cream in it. Drink this tea daily once or twice for effective results. However, women who are pregnant, breastfeeding, wants to get pregnant, has a history of ovarian, breast or uterine cancer, or have hormone related problems must never consume this. Henceforth it is best to drink it only under medical advice. Facial hair is a very embarrassing thing for all the women, and many go for expensive or painful procedures of hair removal. But, if you have a bit of patience, you may be able to get rid of them permanently using the natural ingredients that are always better than their chemical counterparts. 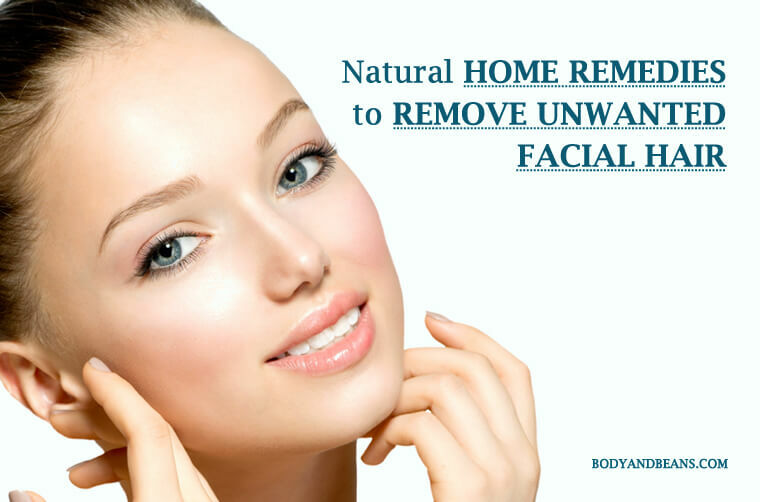 I have discussed some of the best and effective natural home remedies to remove unwanted facial hair. These remedies are not just safe but easy to apply and very much affordable. Growth of facial hair has lot of causes behind it, starting from hormonal changes to obesity to other medical conditions. So the first thing which you have to do is to identify the cause behind it and accordingly go for the solutions. 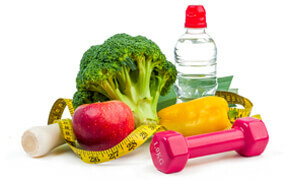 If it is for obesity, then you must exercise and try to reduce your extra pounds and side-by-side use this natural procedures. On the other hand, if it is for some serious medical issue, then it is preferable to go for medical help first and then consult with him/her whether you can use any of these natural home remedies to remove unwanted facial hair together with the medicines prescribed. However, please do maintain discipline in your life, have a balanced nutritious diet, drink water and exercise daily not just to remove facial hair but for good health and wellbeing. Are you tired of unwanted facial hair? Have you ever used any of the remedies to remove unwanted facial hair that we have discussed in this post? Which one worked for you? Do share me your feedback and tell me about any other natural home remedy which helped you in removing unwanted hair. Until then, stay healthy, stay gorgeous and do not let your facial hair hamper your day.